The town of Jasper is a beautiful and charming community nestled in Jasper National Park, the largest and one of the most beautiful parks in the Canadian Rockies. 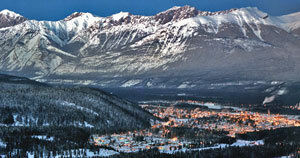 The nearest ski resort to Jasper is Jasper Marmot Basin. The nearest airport to fly into is Calgary International YYC which is 426 kms away from Jasper, about 5 hours drive. Jasper's tranquil setting provides a magnificent back drop for the varied wildlife which roam free in open areas of protected wilderness. Deer, elk and other wildlife often wander the streets of Jasper in the winter time. The Canadian Rockies provide protection against the harsh weather resulting in warmer winters. Jasper is a small town with just 4,500 permanent residents and has maintained a quiet charm and remains an unspoiled and friendly community without many of the commercial trappings often found in some other ski resort towns. Jasper is the quietest in the winter time, as it is the off-peak. This means that you will have more time on the slopes and less time in the line-ups. Jasper's situation in the protected Jasper National Park means that any development is very much restricted. These restrictions on growth ensure that Jasper will preserve it's natural beauty and charm for many years to come. Some of the hotels are a little dated due to these strict development limitations. There are no ski-in/ski-out on-mountain ski accommodations available at Jasper Marmot Basin, all guests staying in Jasper catch the daily ski shuttle to and from Jasper Marmot Basin. Your Jasper Marmot Basin lift pass covers just Jasper Marmot Basin and the ski shuttle to and from the ski resort is extra. If you pre-purchase your ski lift pass with us as part of a ski package, you will receive FREE ski shuttles to and from Jasper Marmot Basin. There are several good ski accommodations to choose from in Jasper and there are plenty of excellent places to eat!